Jane Austen, the grandmother of the romantic comedy, seems to be treated to consistently fine film and television adaptations of her work. 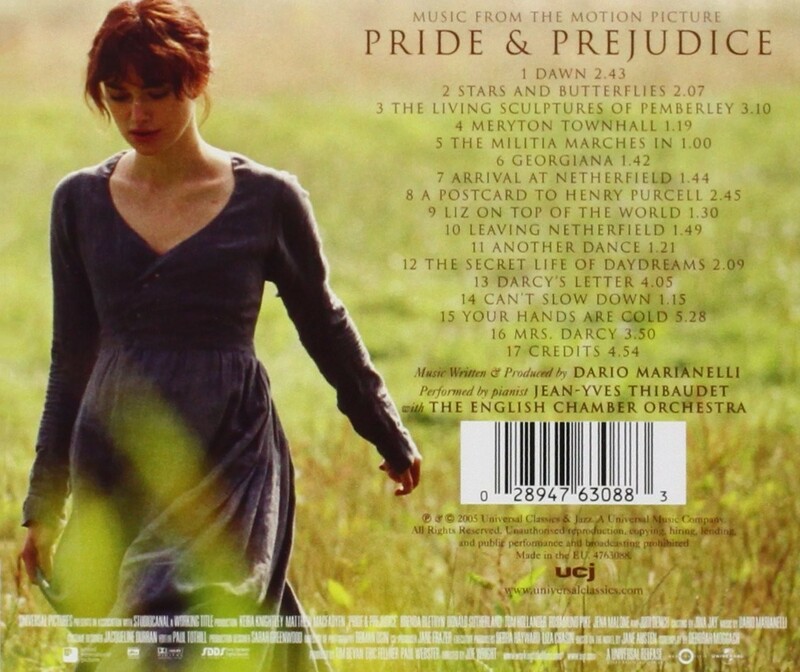 Best known are probably Sense and Sensibility, made by Ang Lee (yes, he of Hulk), starring, and adapted by, Emma Thompson and with a wonderful score by Patrick Doyle, while Gwyneth Paltrow made a splash as Emma and Rachel Portman won an Oscar for her troubles (just a shame Doyle wasn't similarly rewarded for his outstanding score). The best known adaptation of Pride and Prejudice in recent times is, unsurprisingly, the BBC version starring Colin Firth and Jennifer Ehle, topped off with a sprightly Carl Davis' score. 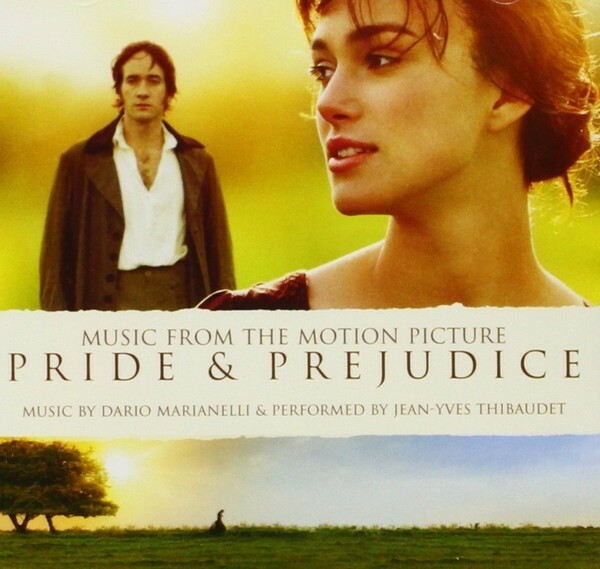 This film version stars Keira Knightly and Matthew MacFadyen and features music by the Dario Marianelli who is turning into the breakthrough composer du jour. Marianelli takes a slightly more refined and graceful approach than Davis; rather than a bouncing main title, Dawn opens with the delicate touch of renowned pianist Jean-Yves Thibaudet (although even an amateur pianist would hardly be challenged faced with Marianelli's solo part). Thibaudet's playing leads the way (much as Davis' score was) and he is backed up by John Barry's favourite band, The English Chamber Orchestra. Marianelli's melodic material is certainly quite lovely, the two main melodies introduced in Dawn and Georgiana respectively, although so restrained as to be a little unmemorable. By the third track, I was rather wondering where some of the Austen joie de vivre had gone, but Meryton Townhall, Another Dance and Can't Slow Down, feature some more playful jigs which add a welcome injection of humour and momentum into an otherwise slightly slow moving and withdrawn album. 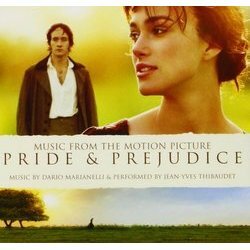 The dramatic high points are reached in Darcy's Letter, which features the only passage orchestrated much beyond strings, woodwind and piano, and Your Hands Are Cold, which is beautifully elegiac as the piano weaves its way around a slower moving string part. Mrs Darcy and Credits are a little more forthright as Austen's heroine gets her man. 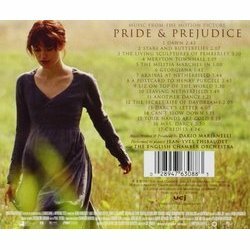 Pride and Prejudice is undoubtedly a lovely score, but, dare I say it, could do with a little more frothiness and vigour. Marianelli seems to have taken everything so seriously that, beyond the short dance tunes, the aforementioned Austen joie de vivre is in rather short supply. There is a thing as too much restraint and compared to the variety of memorable melodies in Doyle's Sense and Sensibility, this seems just a bit too coy. Quite beautiful and endlessly classy, but perhaps lacking the vivaciousness and wit of Austen's heroine.